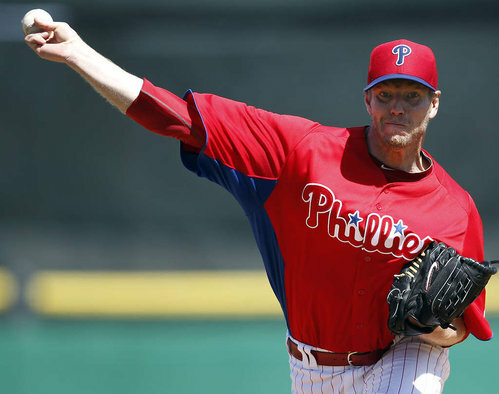 Roy Halladay took to the hill yesterday, against the Natinals, and the results were encouraging. HLH continues to work things back into rhythm, and is not overextending, which I think key this spring as our hero prepares for what surely will be a "return to form" season, both individually and for the team. Doc's excellence was even osmotic! Catching prospect Tommy Joseph, one of whose five tools is permeability, used Roy's cutters as fuel for a 3 for 4 effort at the plate, inclusive of a stone-cold gunning down of an attempted base-stealer. "BUT ZWR, WHAT WAS THE LINE? WE NEED TO KNOW, WE NEED TO KNOW, TELL US ZEE DUB ARR CAUSE WE NEED TO KNOW!!!" Besides throwing four scoreless innings? "DID ROY SEND ANY MESSAGES?! DID HE DO ANYTHING THAT MAY IN SOME WAY SIGNAL A MINDSET TO ANTICIPATE THIS SEASON? OR PERHAPS PARTICIPATE IN SOME SORT OF EVENT THAT MEANT MORE THAN THE MERE CIRCUMSTANCES WOULD NORMALLY DICTATE?!" 4 IP, 0 (zero) R, 2 K (1C/1SC), 1 BB (ump's fault), 1 scrub scared to death, 1 heart of Chase Utley's warmed. About the pitch behind whatever that guy's name is, my colleague in professional mainstream media journalism-- David "HIGH CHEESE" Murphy-- posted a fine pictorial recap. "That one slipped a little bit"
If that one *really* slipped the whole world would have felt it.